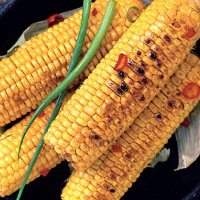 Keep your mielies (corn on the cob) in their natural overcoats to protect them from the heat of the braai (barbecue). A simple butter spiked with chilli and herbs is all that’s needed in addition to the smoky flavour. Place the butter in a bowl and mash in the thyme, lemon zest, chilli and garlic. Season with salt and stir. Carefully peel back the corn husks and remove the corn silk. Smear 2 tbsp flavoured butter over each cob then fold the husks back over the corn and tie with string to keep them in place. Transfer the remaining butter to a small bowl and chill. Soak the corn cobs in a bowl of cold water for 1 hour; this will prevent the husks from catching fire when cooking. Drain and wrap each in foil. Cook on a grill rack for 15 minutes over medium coals with a moderate coating of ash, turning occasionally. Remove the foil and cook for a further 5 minutes, until the husks are charred. Serve with some extra flavoured butter on the side.